The #HuntTheNation Profile series on Sportsmen’s Nation highlights hunters from Instagram whose photos made us pause and take note. Sharing a conversation, we dig deeper into the images that grabbed our attention and the stories behind them. If you are a die-hard sportsman with a story to tell, tag your favorite photos with #HuntTheNation for a chance to be featured on the blog. Tell us a little about your background. What got you in to hunting? In the Ozarks, hunting and fishing are a way of life and one that I was introduced to at a very young age. I have been on the lake or in the woods since I was able to hold a fishing pole or shoot a .22 and have many fond childhood memories of spending time on the White River trout fishing with my grandparent’s and hunting squirrels, deer and turkey with my dad and younger brother. I am fortunate to be 15 minutes from the Buffalo National River which gives us access to over 36,000 acres of public land. We are also located only 20 minutes from Bull Shoals Lake, which has over 2,000 miles of shoreline. No one in my family was a land owner and we took full advantage of the public land around us. We were also fortunate to have permission on a few large tracts my dad gained access through with his job in the lumber industry. As I got older, I progressed and learned more about hunting and it became more of a passion than a past time. Looking for new challenges, I got my first bow around the age of 14. I am now to the point where I do not gun hunt very often for deer. I enjoy the rush and the patience that is involved in bow hunting. I purchased a piece of land around 3 years ago with the intent of using it strictly for bowhunting and I have stuck with that promise. I am starting to see higher quality deer on camera since we have been selective on the deer we harvest, and continue to learn deer behavior and make habitat improvements. Tell us more about becoming a land owner. What are some of the challenges you face in managing the property for whitetail? What kind of habitat management work have you been undertaking? I became a land owner in the spring of 2016 at the age of 25. I wanted to have a piece of land that I could call my own and not have to worry about pressure from other hunters. I wanted to find something that was affordable, remote, and within a half hour of my home. I contacted a local land broker who had a tract that was in my price range but because of my age he refused to even show it to me until I brought proof that I could get approved. I continued my search with another real estate agent who would send me new parcels when they came available. I was also doing my own research and I came across a property that was advertised as 40 acres. I bought it. After purchase I had the land surveyed and I have 47 acres in total. It is perfect and has everything that I was looking for. There is a year around creek with a spring that flows even during severe droughts. There are two large ridges with mature white oaks that always produce a healthy acorn crop. I have thick dense hillsides that work perfect for bedding. Best of all, its remote. I am at the end of a dead-end country road and down a private lane. Then a half mile easement to access my land. To many people the difficult access would be turn off, but for me it was all I could ask for. I’ve learned that being a land owner is something that takes up a lot of my free time. I am constantly working on projects to improve hunting on the land. I’ve built 2 food plots that have proved to be very successful; they seem to attract deer heavily, especially after the acorns are gone. We are planning on improving habitat this winter by hinge cutting, planting some fruit trees, and doing some post season dozer to expand my food plots. So far the financial investment has been fairly small, the real investment is time. Here in northern Arkansas we also have a major feral hog problem and my land is no exception. The hogs seem to come and go but when they are on the property, they are thick. From what I have experienced the presence of hogs often pushes deer off. In order to thin them out, I shoot and trap them and have had great success doing both. It seems that once you have made an impact like this it will push them off the property for a while. For people who are thinking about purchasing their own place, if you are able, do it. I have not had a single regret and the monthly investment is small. Land prices are always increasing. I would rather put money into land that I can sell in the future, than solely relying on a 401k. You are able to use your investment now and it will likely increase in value just as fast as investing in a retirement fund. If anyone is looking to purchase land, they need to check out a Farm credit facility. Mine offers good rates, and a profit sharing check every year that normally equals almost 2 months of a land payment. What is your favorite species to hunt and with what equipment? Several years ago, my younger brother came to me with the bright idea of building a bow fishing boat. I had never bow fished before, but he had a few times with some friends. We started out with a boat that we had less than $1,500 dollars in. We knew very little about the sport but we knew it was fun. We were hooked and spent 4-5 nights a week at the lake. 4 years and 3 boats later we have learned a lot about the sport; where to find fish at pretty much anytime of the year and how to find bigger fish. We were talking with another bow fishing and deer hunting friend about how bow fishing was something we used to do in the off season while we wait for deer season to begin. Now we joke and say that bow fishing is a season in its self. Bow fishing ranks right up there with whitetail hunting for me. It’s hard to think of a better time than shooting fish with your friends that love the outdoors as much as you. The fellowship that comes along with bow fishing is something that needs to be experienced by every outdoorsman or woman. You are able to laugh, tell stories, and shoot bows. The lakes or rivers truly come alive at night. I have seen bass and catfish that are bigger than I can imagine. We are only shooting rough fish but catfish are legal in Arkansas certain times of the year. I encourage anyone that enjoys hunting or fishing to try bow fishing. Its cheap fun; you don’t need an expensive bow and a fancy boat. You can have the time of your life with a pawn shop bow and a reel. You don’t even need to start off with a boat. I honestly don’t think I would be able to choose between deer hunting and bow fishing. If I have a bow in my hand, I am happy. How did last hunting season shake out? What did you hunt and did you find success? After taking on my new job last year I found myself extremely busy and didn’t get out in the woods as much as I hoped. I did manage to harvest a couple does and a very large hog. I took 4 days and went up to hunt northern Missouri and had a shot at one of the biggest bucks I have ever seen. I shot just over his back and literally shaved the hair off. I have pictures to prove it! I have found myself hunting less and less each year with a gun and last year took a deer rifle out on only one trip. I am very excited about having more free time to hunt this year and about what I’ve seen through summer scouting. 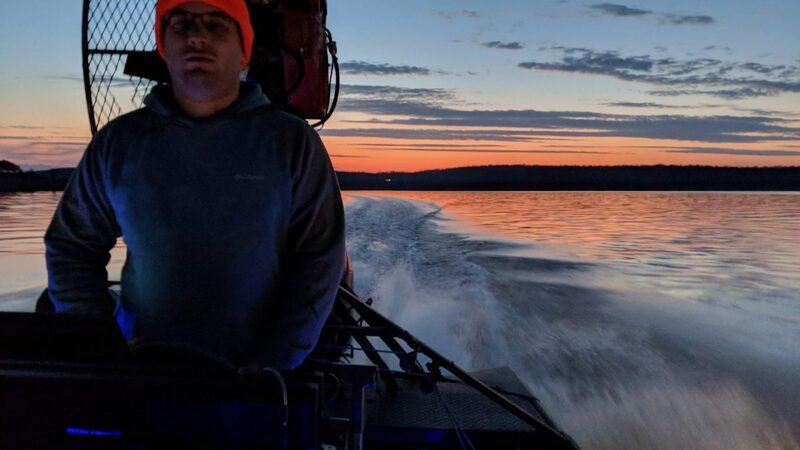 On the bow fishing side of things, we had an awesome year filling the boat on multiple occasions, having a couple BAA world records taken from our boat, and introducing some new people to the sport. 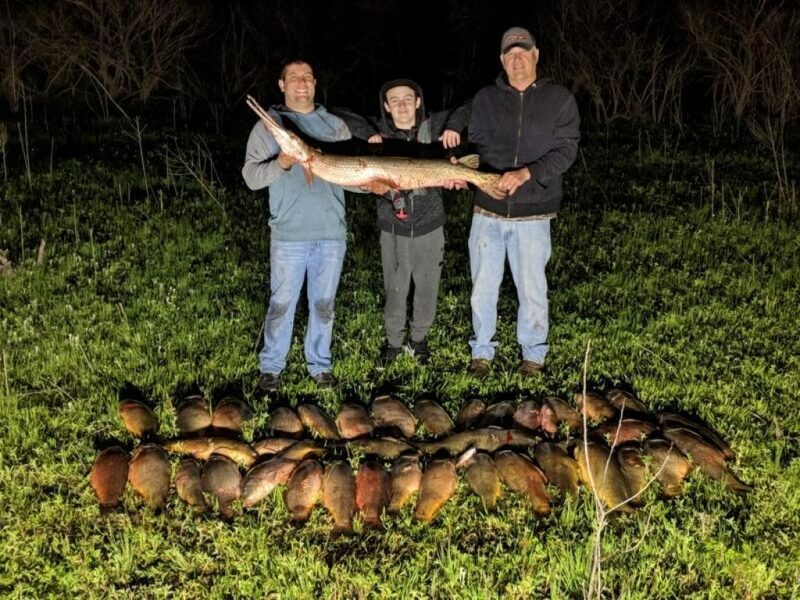 Bow fishing sounds like a ton of fun. Any advice for those who want to get started? As I mentioned earlier, getting in to the sport of bow fishing doesn’t have to be expensive. If you want to try if for the first time and don’t have your own bow, try to get in contact with someone who has a boat. Most of the time they will be more than happy to take you. I have brought too many people to count on their first bow fishing trip and many of them are buying bows shortly after. If you are looking to try it and you don’t know anyone with a boat, I would suggest going to a local pawn shop and buying a bow, spending no more than 100 dollars. I would also suggest getting something in the 30-50-pound range. This will be more than enough for even the biggest river fish. You will also be shooting a lot more and pulling back a 60-70-pound bow 100 times a night you will have sore fingers and arms. In addition to the bow, you will have about 100 dollars or so in getting set up with a good reel. I do suggest getting good reel, as it seems to cut down frustrations. If you are not familiar with when carp spawn, ask some local bass fisherman and they will be happy to tell you when and where they are seeing carp. In mid-spring on shallow flats in the backs of creeks you will have the time of your life wading and shooting fish. Check local laws and be sure there are no special regulations in your area pertaining to bow fishing. Most bow fishermen are avid conservationists and bow fishing improves habitat for other game fish. Please dispose of the fish you shoot properly; don’t leave fish laying on the banks as it gives a bad name to other bow fisherman. In closing, if you are interested in picking up a bow and reel, get in contact with anyone you can in the bow fishing community. We love to share our love for the sport.